Planning a visit to the fantastic city of Berlin? Whether it's a short break or a longer adventure, a Berlin Pass UK voucher can get you great discounts on all of the main attractions. From free entry to world-class museums and art galleries to free travel cards and guidebooks, Berlin Pass UK voucher codes will help you get the most out of your visit without spending a fortune. Berlin Pass UK was created to provide tourists and holidaymakers with a cost effective way of exploring one of Europe's most fascinating cities. Designed in partnership with some of the city's most popular attractions, Berlin Pass UK allows you to make a one-off purchase and then enjoy free entry and access to fantastic things to do all around the city – saving you both money and time. The Berlin Pass UK is a simple sightseeing card that operates on a scan-and-enter system and functions as your all-in-one ticket to Berlin's best attractions, monuments, museums and galleries. Unlike other sightseeing cards that give you discounted access to a limited number of attractions, Berlin Pass UK gets you into all of the city's top 60 attractions completely free of charge once you have paid the one-off fee for the card itself. If you're planning on spending some time touring Berlin, Berlin Pass UK represents fantastic value for money. Fancy experiencing some of the culture the city is famous for? Your Berlin Pass UK includes free entry to world-famous attractions like the Pergamon Museum, Bode Museum, Neue National Gallery and many more. Or perhaps you want to discover more about Berlin's turbulent but fascinating past? Your pass gets you unrestricted access to Checkpoint Charlie, the Stasi Museum, the Jewish Museum Berlin and plenty more interesting sites. The Berlin Pass UK is also great for those that want to explore the city at a faster pace. As well as expert walking tours from companies like Insider Walking Tours, visitors can discover the city on two wheels with Fat Tire Bike Tours, hop aboard an open top bus or take to the waters of the River Spree in a relaxing boat tour – all without paying a penny extra! On top of all this, your Berlin Pass UK also includes a free travel card for navigating the city by bus and train, not to mention an exclusive free guidebook which can be posted out to you if you purchase your card in advance – allowing you to get planning for the trip of a lifetime. Want to upgrade your holiday with Berlin Pass UK? With a Berlin Pass UK voucher you can enjoy fantastic savings on this fantastic value sightseeing card. So whether you just want to spend a few days seeing the most popular museums or a whole week really getting under the skin of the city, Berlin Pass UK vouchers will help you save the pennies. Free travel card and guidebook with every pass. Browse our website until you find a Berlin Pass UK voucher that suits you, then navigate to their website to begin shopping. Choose your pass and click 'Add to basket'. Choose your estimated start date. Click to add a promo code. Enter your Berlin Pass UK discount codes in the box provided and click 'Apply code'. If you've enjoyed shopping at Berlin Pass UK, you might also like to check out more great deals on travel and sightseeing at stores like TripAdvisor or lasminute.com. Or, if those aren't right for you, you'll find plenty more deals to browse in our Travel section. Enter your Berlin Pass UK voucher in the box provided and click 'Apply code'. Enter your payment details and click 'Proceed' to complete your booking. You can choose to have your Berlin Pass UK shipped to you so that you can enjoy the benefits from the moment you land – a choice of shipping options are available. You can also choose to collect your pass in Berlin free of charge. Berlin Pass UK insurance is available for those that may wish to return their pass. Insurance holders can cancel unused passes in exchange for a full refund. Need to speak to the team at Berlin Pass UK? Whether you have a question about your order, want to know more about the attractions covered by the pass or simply want to find out how you could make fantastic savings with Berlin Pass UK vouchers, you can contact the Customer Services department by accessing the online help centre here. Want to find out more about discovering one of Europe's most exciting cities on the cheap with Berlin Pass UK? Why not follow the company across your favourite social media networks? You'll find lots of exclusive content including hints and tips on planning your trip, special offers and more. You can also use these pages to find out more about saving money with Berlin Pass UK voucher codes. Don’t forget to check them regularly, as you can never be sure when a free Berlin Pass UK discount code might be waiting for you! 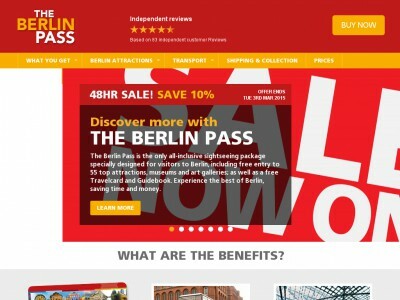 Buy now online at www.berlinpass.com. I'd always wanted to visit Berlin, but with all the places on my itinerary I was worried about the mounting cost of entry. Then I discovered a Berlin Pass UK voucher online. With Berlin Pass UK vouchers you can visit berlinpass.com and get a great deal on a sightseeing card that gives you access to all the top attractions. With my Berlin Pass UK voucher codes I paid one low fee and got free access to the best museums, galleries and tours. We had a great time without spending a fortune, all thanks to a Berlin Pass UK discount code.